Linux packaging was a nightmare for years. But recently serious contenders came up claiming to solve the challenge: first containers changed how code is deployed on servers for good. And now a solution for the desktops is within reach. Meet Flatpak! In the beginning I probably should admit that over the years I identified packaging within the Linux ecosystem as a fundamental problem. It prevented wider adoption of Linux in general, but especially on the desktop. I was kind of obsessed with the topic. Due to a missing standard it was not easy enough for developers to package software. If they used one of the formats out there they could only target a sub-set of distributions. This lead to lower adoption of the software on Linux, making it a less attractive platform. Since Linux was less attractive for developers, less applications were created on/ported to Linux. This lead to a smaller ecosystem. Thus it was less attractive to users since they could not find appealing or helpful applications. Due to missing packages in an easy-accessible format, installing software was a challenge as soon as it was not packaged for the distribution in use. So Linux was a lot less attractive for users because few software was available. In hindsight I must say the situation was not as bad as I thought on the server level: Linux in the data center grew and grew. Packaging simply did not matter that much because admins were used to problems deploying applications on servers anyway and they had the proper knowledge (and time) to tackle challenges. Additionally, the recent rise of container technologies like Docker had a massive impact: it made deploying of apps much easier and added other benefits like sandboxing, detailed access permissions, clearer responsibilities especially with dev and ops teams involved, and less dependency hell problems. Together with Kubernetes it seems as there is an actual standard evolving of how software is deployed on Linux servers. To summarize, in the server ecosystem things never were as bad, and are quite good these days. Given that Azure serves more Linux servers than Windows servers there are reasons to believe that Linux is these days the dominant server platform and that Windows is more and more becoming a niche platform. On the desktop side things were bad right from the start. Distribution specific packaging made compatibility a serious problem, incompatible packaging formats with RPMs and DEBs made it worse. One reason why no package format ever won was probably that no solution offered real benefits above the other. Given today’s solutions for packaging software out there RPM and DEB are missing major advantages like sandboxing and permission systems. They are helplessly outdated, I question if they are suited for software packaging at all today. There were attempts to solve the problem. There were attempts at standardization – for example via the LSB – but that did not gather enough attraction. There were platform agnostic packaging solutions. Most notably is Klik which started already 15 years ago and got later renamed to AppImage. But despite the good intentions and the ease of use it never gained serious attention over the years. But with the approach of Docker things changed: people saw the benefits of container formats and the technology technology for such approaches was widely available. So people gave the idea another try: Flatpak. Flatpak is a “technology for building and distributing desktop applications on Linux”. It is an attempt to establish an application container format for Linux based desktops and make them easy consumable. According to the history of Flatpak the initial idea goes way back. Real work started in 2014, and the first release was in 2015. It was developed initially in the ecosystem of Fedora and Red Hat, but soon got attention from other distributions as well. Additionally it features a sandboxing environment and a permissions system. The most appealing feature for end users is that it makes it simple to install packages and that there are many packages available because developers only have to built them once to support a huge range of distributions. By using Flatpak the software version is also not tied to the distribution update cycle. Flatpak can update all installed packages centrally as well. The interface is simple but has a somewhat proper design. Each application features screenshots and a summary. The apps themselves are grouped by categories. The ever changing list of new & updated apps shows that the list of apps is ever growing. A list of the two dozen most popular apps is available as well. Of course there is lots of room for improvement: at the time of writing there is no way to change or filter the sorting order of the lists. There is no popularity rating visible and no way to rate applications or leave comments. Last but not least, there is currently little support from external vendors. While you find many closed source applications in Flathub, hardly any of them were provided by the software vendor. They were created by the community but are not affiliated with the vendors. To have a broader acceptance of Flatpak the support of software vendors is crucial, and this needs to be highlighted in the web page as well (“verified vendor” or similar). As mentioned Flatpak has repositories baked in, and it is well documented. It is easy to generate your own repository for your own flatpaks. This is especially appealing to projects or vendors who do not want to host their applications themselves. While today it is more or less common to use a central market (Android, iOS, etc.) some still prefer to keep their code in there hands. It sometimes makes it easier to provide testing and development versions. Other use cases are software which is just developed and used in-house, or the mirroring of existing repositories for security or offline reasons: such use cases require local hubs, and it is no problem at all to bring them up with Flatpak. Flatpak is currently supported on most distributions. Many of them have the support built in right from the start, others, most notably Ubuntu, need to install some software first. But in general it is quite easy to get started – and once you did, there are hundreds of applications you can use. Some more technical differences are in the way packages are built, how the sandbox work and so on, but we will noch focus on those in this post. The Snapcraft market place called snapcraft.io provides lists of applications, but is much more mature than Flathub: it has vendor testimonials, features verified accounts, multiple versions like beta or development can be picked from within the market, there are case stories, for each app additional blog posts are listed, there is integration with social accounts, you can even see the distribution by countries and Linux flavors. And as you can see, Snapcraft is endorsed and supported by multiple companies today which are listed on the web page and which maintain their applications in the market. Flathub has a lot to learn until it reaches the same level of maturity. However, while I’d say that snapcraft.io is much more mature than Flathub it also misses the possibility to rate packages, or just list them by popularity. Am I the only one who wants that? The main disadvantage I see is the monopoly. snapcraft.io is tightly controlled by a single company (not a foundation or similar). It is of course Canonical’s full right to do so, and the company and many others argue that this is not different from what Apple does with iOS. However, the Linux ecosystem is not the Apple ecosystem, and in the Linux ecosystem there are often strong opinions about monopolies, closed source solutions and related topics which might lead to acceptance problems in the long term. Also, technically it is not possible to launch your own central server for example for in-house development, or for hosting a local mirror, or to support offline environments or for other reasons. To me this is particularly surprising given that Snapcraft targets specifically iot devices, and I would run iot devices in an closed network wherever I can – thus being unable to connect to snapcraft.io. The only solution I was able to identify was running a http proxy, which is far from the optimal solution. The good news is that snaps are updated automatically in the background every day! While in the end a development model with auto deployments, even dozens per day, is a worthwhile goal I am not sure if everyone is there yet. So while Snapcraft has a mature market place, targets much more use cases and provides more packages to this date, I do wonder how it will turn out in the long run given that we are talking about the Linux ecosystem here. And while Canonical has quite some experience to develop their own solutions outside the “rest” of the community, those attempts seldom worked out. I’ve already mentioned AppImage above and I’ve written about it in the past when it was still called Klik. AppImage is “way for upstream developers to provide native binaries for Linux”. The result is basically a file that contains your entire application and which you can copy everywhere. It exists for more than a dozen years now. The thing that is probably most worth mentioning about it is that it never caught on. After all, already long time ago it provided many impressive features, and made it possible to install software cross distribution. Many applications where also available as AppImage – and yet I never saw wider adoption. It seems to me that it only got traction recently because Snapcraft and Flatpak entered the market and kind of dragged it with them. I’d love to understand why that is the case, or have an answer to the “why”. I only have few ideas but those are just ideas, and not explanations why AppImage, in all the years, never managed to become the Docker of the Linux desktop. Maybe one problem was that it never featured a proper store: today we know from multiple examples on multiple platforms that a store can mean the difference. A central place for the users to browse, get a first idea of the app, leave comments and rate the application. Docker has a central “store”, Android and iOS have one, Flatpak and Snapcraft have one. However, AppImage never put a focus on that, and I do wonder if this was a missed opportunity. And no, appimage.github.io/apps is not a store. Another difference to the other tools is that AppImage always focused on the Open Source tools. Don’t get me wrong, I appreciate it – but open source tools like Digikam were available on every distribution anyway. If AppImage would have focused to reach out to closed source software vendors as well, together with marketing this aggressively, maybe things would have turned out differently. You do not only need to make software easily available to users, you also need to make software available the people want. Last but not least, AppImage always tried to provide as many features as possible, while it might have benefited from focusing on some and marketing them stronger. As an example, AppImage advertises that it can run with and without sandboxing. However, sandboxing is a large benefit of using such a solution to begin with. Another thing is integrated updates: there is a way to automatically update all appimages on a system, but it is not built in. If both would have been default and not optional, things maybe would have been different. But again, these are just ideas, attempts to find explanations. I’d be happy if someone has better ideas. 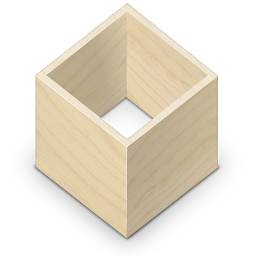 There are some disadvantages with the Flatpak approach – or the Snapcraft one, or in general with any container approach. Most notably: libraries and dependencies. Especially the last part is crucial: in case of a serious library security problem the user has to rely on each and every package vendor that they update the library in the package and release an updated version. With a dependency based system this is usually not the case. People often compare this problem to the Windows or Java world were a similar situation exists. However, while the underlying problem is existent and serious, with Flatpak at least there is a sandbox and a permission system something which was not the case in former Windows versions. There needs to be made a trade off between the advanced security through permissions and sandboxing vs the risk of having not-updated libraries in those packages. That trade off is not easily done. But do we even need something like Flatpak? But we are not there yet and today there is still the need for easy consumption of software on Linux desktops. I would have hoped though to see this technology and this much traction and distribution and vendor support 10 years ago. But as a conclusion I say that the days of difficult-to-install-software on Linux desktops are gone. I am not sure if Snapcraft or Flatpak will “win” the race, we have to see that. At the same time we have to face that desktops in general are just not that important anymore. But until then, I am very happy that it became so much easier for me to install certain pieces of software in up2date versions on my machine. Ansible Tower 3.1 was just released. Time to have a closer look at some of the new features like the workflow editor. Just a few days ago, Ansible Tower 3.1 was released. Besides the usual bug fixes, refinements of the UI and similar things this Tower version comes with major new feature: a workflow editor, scale out clustering, integration with logging providers and a new job details page. The basic idea of a workflow is to link multiple job templates coming one after the other. They may or may not share inventory, playbooks or even permissions. The links can be conditional: if job template A succeeds, job template B is automatically executed afterwards, but in case of failure, job template C will be run. And the workflows are not even limited to job templates, but can also include project or inventory updates. This enables new applications for Tower: besides the rather simple execution of prepared job templates, now different workflows can build upon each other. Imagine the networking team which creates a playbooks with their own content, in their own Git repository and even targeting their own inventory, while the operations team also has their own repos, playbooks and inventory. With older Tower versions there would be no simple way to bring these totally separated ways together – with 3.1 this can be done even with a graphical editor. The button to add a new template offers a small arrow to get a menu from which a workflow can be set up. The above screenshot shows the major highlights: links depending on the result of the previous job template in red and green, blue links which are executed every time, a task in the workflow to update a project (indicated by the “P”), and the actual editor. As shown above a logstash logging provider was configured to gather all the Tower logs. Other possible providers are splunk, and in general everything which understands REST calls. Overall the new release is pretty impressive. Especially the workflow editor will massively help bringing different teams even closer in automation (DevOps, anyone?). Also, the cluster feature will certainly help create stable, HA like setups of Tower. The UI might take some time to get used to, but that’s ok, since there will be a benefit at the end. So, it is a great release – get started now! Ansible has an ever growing list of modules. For a single module this raises the question: who is responsible for it? And what is the actual status? Here a new metadata field will most likely be introduced soon. With Ansible getting more and more traction every day, more modules are popping up everywhere – most of them inside the Ansible repository, some of them outside in the community. However, with this ever growing list of modules – almost a thousand by now – questions came up what the actual state of a module is: does it have a stable interface? Is it a preview, or is it already deprecated? And who maintains it in case I have an idea for a new feature or a change? The Ansible community, the core developers team, is there a maintainer, or is the committer the person to talk to? This will help to better understand in the future who is responsible for which module, and who can be approached. Note though that while there are plans to include it with Ansible 2.3, this is not yet released so this is still subject to change. Also, keep in mind that this is a feature for the community to work together on the project – it has nothing to do with any support statement made in any contract for example with Red Hat when purchasing Ansible Tower by Red Hat. 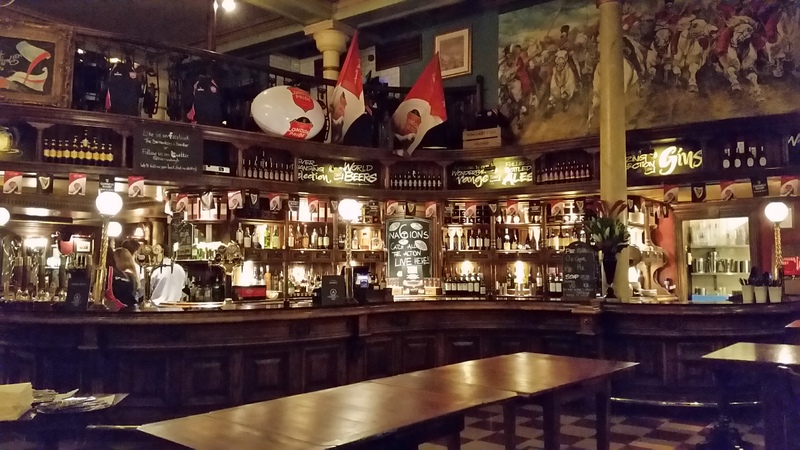 The #AnsibleFest was taking place in London, and I was luckily able to attend. This post shares some impressions from the event, together with interesting announcements and stories. Update: The slides of the various presentations are now available. 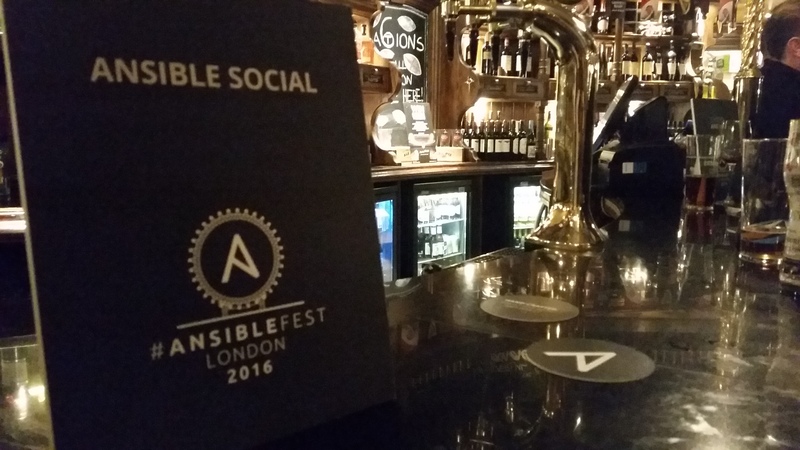 The #AnsibleFest London 2016 took place near the O2 Arena and lasted the entire day. The main highlight of the conference was the network automation coming along with Ansible now. Other very interesting talks covered very helpful tips about managing Windows Servers, the 101 on modules, how to implement continuous deployment, the journey of a french bank towards DevOps, how Cisco devices can be managed and how to handle immutable infrastructure. All focused on Ansible, of course. But while the conference took place during Thursday, the #AnsibleFest started already the evening before: at the social event Ansible Social. And it was a wonderful evening: many people from Ansible, partners, coworkers from Red Hat and others were there to enjoy drinks, food and chatting through the evening. Getting to know many of the people there went pretty well, it was a friendly bunch meeting at a pretty nice place. 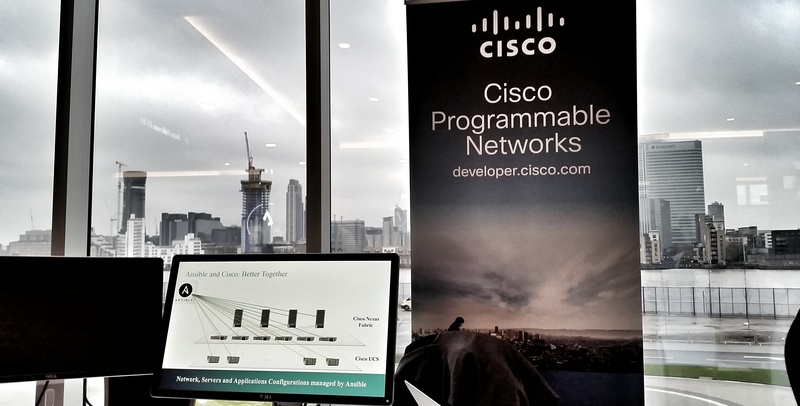 Upon arrival at the conference area one of the sponsor desks immediately caught the eye: Cisco! For everyone following Ansible news closely it was obvious that networking would be a big topic, especially since it was about to be featured twice during the day, once by Peter Sprygada from Ansible and later on by Fabrizio Maccioni from Cisco. And this impression was confirmed when Todd Barr came to the stage and talked about the current state of Ansible and what to expect in the near future: networking is a big topic for Ansible right now, they are pushing resources into the topic and already hinted that there would be a larger announcement during the #AnsibleFest. During the presentation the strengths of Ansible were of course emphasized again: that it is simple to setup, to understand and to deploy. And that it does not require agents. While I do have my past with Puppet and still like it as a tool in certain circumstances, I must admit that I had to smile at the slide about agents. I have to admit, for many customers and many setups this is in fact true: they do not want agents for various reasons. And Ansible can deliver actual results without any need for a client. Next up was Bill Nottingham talking setting the road for the future of Ansible. A focus is certainly better integration of Windows (no beta tag anymore! ), better testing – and Python 3 support! It was acknowledged that there are more and more distributions out there not providing any Python 2 anymore and that they need to be catered. Ansible Tower was also covered, of course, and has very promising improvements coming up as well: the interface will be streamlined, the credentials and rights system will be improved, and there will be (virtual) appliances to get Ansible Tower out of the box in an instant. But the really exciting part is more large-scale, enterprise focused: Ansible Tower will be able to cater federated setups, meaning distributed replication of Ansible Tower commands via proxy Towers. Don’t expect this all in the next weeks, but we might see many of these features already in Ansible Tower 3.0. And it was mentioned that there might be a release in early fall. Scaling abilities are indeed needed – many data centers these days have more than one location, or are spread over several departments and thus need partially independent setups to manage the infrastructure. At the same time, there are Ansible customers who are using Ansible with 50k nodes and more out there, and they have a demand for fine grained, federated infrastructure setups as well. [Red Hat] is bringing DevOps to networking by extending Ansible – its powerful IT automation and DevOps platform – to include native agentless support for automating heterogeneous network infrastructure devices using the same simple human and machine readable automation language that Ansible provides to IT teams. Peter picked that up and presented a whole lot of technical details. The most important one was that there are now several networking core modules for commands, configuration and templates. While some of these devices were already supported by the raw module or some libraries out there, but fully integrated modules supported by Ansible and the network device manufacturers themselves takes networking automation to another new level. If you are interested, get the latest Ansible networking right away. John Hawkesworth from M*Modal came up to the stage next and delivered a brilliant speech about all the things needed to know when managing Windows with Ansible. Talking about the differences of Ansible 1.9 vs 2.0 briefly, he went over lessons learned like why the backslash should be escaped every time just to be sure (\t …) but also gave his favourite development and modules quite some attention. Turns out the registration module can come in very handy! Next up James Cammarata introduced how to write modules for Ansible. And impressively, this was live demonstrated by a module he had written the days before to control his Philips Hue lights. They could be controlled via Ansible live on stage. It is quite easy to develop modules. Start of simply, get more complex the further you go down the road. Write a module when your Playbook for a single task exceeds ten lines of code. Write in Python/Powershell when you want it to be integrated with Ansible Core. Write in any language you want if you won’t share it anyway. While I am sure that other module developers might see some of these points different, it gives a rather good idea what to keep in mind when the topic is approached. Of course, the the code for the Philips Hue Ansible module is available on Github. Continuous integration is a huge topic in DevOps, and thus especially with Ansible. Steve Smith of Atlassian picked up the topic and discussed what needs to be taken into account when Ansible is used to enable continuous integration. It means: do release when you have something worth releasing – not at arbitrary dates. It is a strong statement against release or maintenance windows and does make sense: after all, why should you release when its not worth? And you certainly will not wait if it is important! Everything which is hard should be done more often, not less. Combined with the fact that very complex, but successful enterprises do 300 releases an hour it is clear that continuous deployment is possible – but what often is needed is the right culture and probably at some point a great, simple to use tool able to cater the needs of complex infrastructure. It’s not the big that eat the small. It’s the fast that eat the slow. This is true for all the enterprises out there: software enabled companies have attacked almost any given business out there (Amazon vs Walmart, Uber vs cabs, Airbnb vs hotels and hostels, etc.). And there are enough analysts right now who see the banking market as the next big thing which might be seriously disrupted due to mobile payment, blockchain technology and other IT based developments. Automation is about cultural change. Move fast and break things! After these two powerful talks the audience had a chance to catch some breath during the interactive DevOps discussion. It mainly picked up the topics from the previous talks, and it showed that everyone in the room is pretty sure that DevOps as such is more or less a name on the underlying situation that enterprises need to adopt – or they will fail in the long term, no matter how big they are. As already mentioned, Fabrizio Maccioni from Cisco had the second talk about managing networks with Ansible. 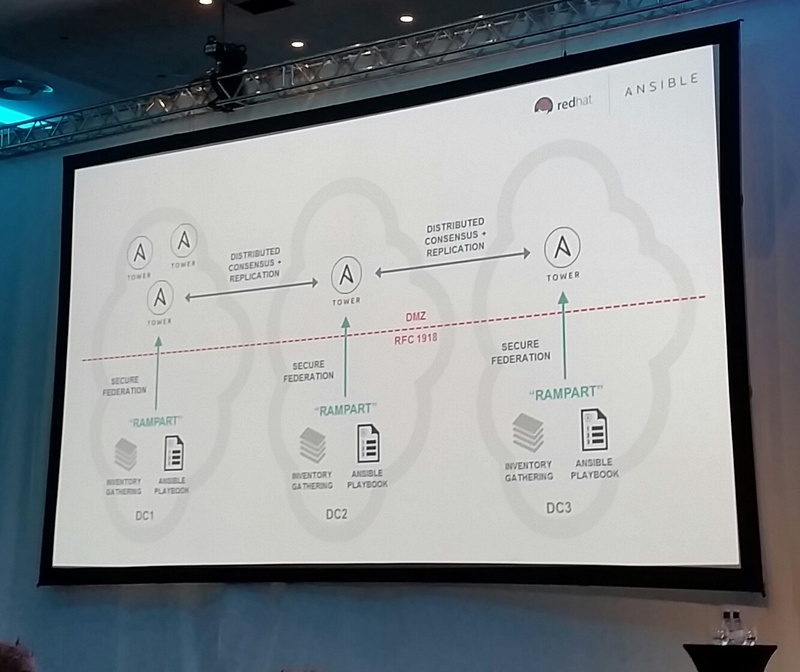 Interestingly enough, he mentioned that the interest to support Ansible was brought to them by customers who were already managing part of their infrastructure with Ansible. A key point is that Ansible does not require an agent. While Cisco does support some configuration management agents on their hardware, it seems that most of the customers would not do that. The last presentation was held by Vik Bhatti from Beamly. Their problem is that sometimes they have to massively scale in seconds. Literally, in seconds. That requires them to have images of machines up and running in no time. They do this with Ansible, having the playbooks right on the images on one hand, and using Ansible to control their image build process on the other. Actually, the image builder is Packer and it uses Ansible to partially build the image. As a result, down the line they have images ready to deploy and can extend their environment very, very, very quickly. Since they are able to respond that fast, they were able to cut down hardware costs massively. The final panel dealt mainly with questions about Open Source Tower (it will be there eventually, but no fixed date) and similar questions. After that, everyone went to enjoy drinks and a beautiful skyline. In conclusion the #AnsibleFest was a great success, in terms of the people I met as well as in terms of the technical discussions. I can’t wait to get my hand on the networking modules. I’d like to thank the people from Ansible making this event possible, and of course my employer Red Hat for making it possible to visit this event. So you think offline systems need no updates? Often customers run offline systems and claim that such machines do not need updates since they are offline. But this is a fallacy: updates do not only close security holes but also deliver bug fixes – and they can be crucial. That’s a common misconception. And a dangerous one. Many people think that updates are only important to fix security issues, and that bugfixes are not really worth considering – after all, the machine works, right? Software is never perfect. Errors happen. And while security issues might be uncomfortable, bugs in the program code can be a much more serious issue than “mere” security problems. To pick an example, almost each company out there has one type of system which hardly ever gets updated: copy machines. These days they are connected to the internet and can e-mail scanned documents. They are usually never updated, after all it just works, right? In 2013 it was discovered that many Xerox WorkCentres had a serious software bug, causing them to alter scanned numbers. It took quite some weeks and analysis until finally a software update fixed the issue. During that time it turned out that the bug was at least 8 years old. So millions and millions of faulty scans have been produced over the years. In some cases the originals were destroyed in the meantime. It can hardly be estimated what impact that will have, but for sure it’s huge and will accompany us for a long time. And it was estimated that even today many scanners are still not patched – because it is not common to patch such systems. Offline, right? So yes, a security issue might expose your data to the world. But it’s worse when the data is wrong to begin with. Another example hit the news just recently: the US Washington State Department of Correction released inmates too early – due to a software bug. Again the software bug was present for years and years, releasing inmates too early all the time. While Valve’s systems are often per definition online, the Valve Steam for Linux bug showed that all kinds of software can contain, well, all kinds of bugs: if you moved the folder of your Steam client, it could actually delete your entire (home) directory. Just like that. And again: this bug did not happen all the time, but only in certain situations and after quite some time. Imagine you have a bug in your calculating software – so that numbers are not processed or displayed correctly. The possible implications are endless. Two famous bugs which shows that bugfixes are worth considering are the MS Office multiplication bug from 2007 and the MS Office sum bug from a year later. “deaths were probably radiation related”. So, yes, security issues are harmful. They must be taken serious, and a solid and well designed security concept should be applied. Multiple layers, different zones, role based access, update often, etc. But systems which are secured by air gaps need to be updated as well. The above mentioned examples do not show bugs in highly specific applications, but also in software components used in thousands and millions of machines. So administrators should at least spend few seconds reading into each update and check if its relevant. Otherwise you might ignore that you corrupt your data over years and years without realizing it – until its too late. Posted on January 18, 2016 Categories Business, Debian & Ubuntu, Fedora & RHEL, Linux, Microsoft, Office, Politics, RPM, Security, Shell, SUSE, Technology, ThoughtsTags air gap, bugfix, compliance, errata, offline, security, update, updates, upgrade, xerox2 Comments on So you think offline systems need no updates? As I mentioned in my last post I left my previous employer after quite some years – since July 1st I work for Red Hat. So, its one month since I joined Red Hat and it is been quite an experience so far. Keeping in mind where I come from – infrastructure focused, couple dozen people – Red Hat is something entirely different. They are huge. Like, *really* big. And that shows everywhere. Organization, processes, structure, reach, customers, employees, possibilities, etc. Also, these days Red Hat is much more than just Linux: other huge chunks of Red Hat are Middleware, there are several virtualization products, they are serious towards software defined storage, and they indeed have a very specific idea of what Cloud means and how to do that – and it’s all backed up by products which are again backed by pretty vivid community projects (with colorful names as Drools, Byteman and CapeDwarf). All in all, it’s a lot to learn – and as usual I will use the blog to try to digest everything. Most likely this will focus on technologies I yet don’t even have a clue about – like the aforementioned drooling midgets. But I might also reiterate everything else I have to know in my own words to better learn it – subscription model, product variation, all the shiny stuff you print glossy papers about but have to explain anyway. In my new position I will be a Solutions Architect – so basically a sales engineer, thus the one talking to the customers on a more technical level, providing details or proof of concepts where they need it.